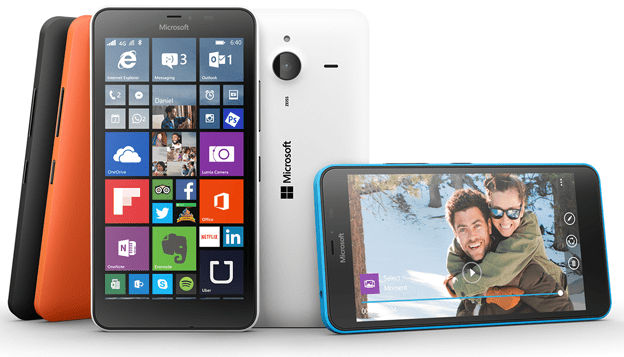 Microsoft this week introduced a couple of new affordable budget Lumia phones. The Lumia 640 and 640 XL. These phones will be replacing last year’s Lumia 635 and 630. Microsoft this week introduced a couple of new affordable budget Lumia phones at Mobile World Congress in Barcelona. The two models are the Lumia 640 and Lumia 640 XL. These phones will effectively be replacing last year’s Lumia 635 and 630. First, the Lumia 640 is an nice upgrade from the 635. It includes a 1.2 GHz quad-core Snapdragon process and 1 GB of RAM — the 635 only includes 512 MB. It’s got 8GB of internal storage that can be expanded up to 128GB with a micro-SD card. The screen is a 5-inch HD with 1280×720, 16:9 IPS 294 PPI display. The rear camera is 8-megapixel, and the front facing one is just 1-megapixel. The Lumia 640 XL gives you a larger screen at 5.7-inches with a 1280×720 16:9 IPS and 269 IPS display. It has a 1.2 quad-core Snapdragon processor, 8GB of internal storage, and you can add a SD card up to 128 GB and comes with 30 GB of OneDrive space for free too. It also includes a 13-megapixel rear facing camera with an LED flash, and a 5-megapixel up front. This one is similar the 640 but adds the benefit of a larger screen and and higher quality front and rear camera. While it does have a larger screen, you need to remember this is the budget phone, and even the XL only provides 720p viewing – not 1080p. Also the cameras are don’t have the advantage of the company’s PureView technology as is available on high-end phones. It’s also worth noting that each phone comes with a one year subscription to Office 360 Personal. These two models won’t be as cheap as their predecessor’s, which both sold for $99 on AT&T and $129 on T-mobile. Right now it looks like the 640 will sell for about $180 for the LTE model, and the XL will be about $240 — it’s a bit less for the 3G models. For those of you waiting for a new high-end flagship Windows Phone, you’ll need to wait a while. It sounds like there will be new high-end phones like the Lumia 930 or Icon, but the company is waiting until Windows 10 is done and released before announcing them. I’m currently using the Lumia 635 and owned the Lumia 520 before that. The 635 is well built for what it is, and Windows 10 for phones runs fast and easy on it. Another cool thing about these budget phones is you can get into the Windows Phone ecosystem on the cheap. Currently you can pick up a 635 for less that $50, and with no contract, you can just use it as a media player and see what Windows Phone is all about. Both of these new Lumia phones will be offered on T-mobile and AT&T off-contract and the XL will start shipping later this month, while the 640 starts rolling out in April. Has anyone tried the Win 10 Preview on a T-Mobile 635? Has it broken anything (like WiFi Calling) that I heard some Cyan preview releases did with the 521 last year (I never tried it for that reason until the OTA release). I have the 635 with the current Cyan now but don’t want to risk something critical being disabled with the Win 10 preview (although I think I saw, maybe here, that it can be rolled back).